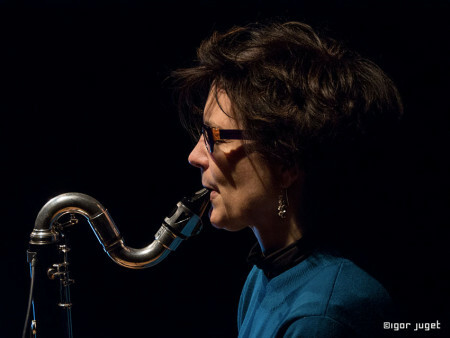 Paris-based composer and clarinetist Carol Robinson has a multifaceted musical life. Equally at ease in the classical and experimental realms, she performs in major festivals and concert halls the world over (Wien Modern, RomaEuropa, MaerzMusik, Huddersfield, Archipel, Musica, Festival d’Automne, Musica Contemporanea, etc.). In addition to working closely with composers, she pursues the new in more alternative contexts, collaborating with video artists, photographers, and musicians from diverse horizons. She began composing by writing for her own music theater productions, subsequently receiving commissions for concert pieces, installations, radio, dance and film productions. Described by Derek Horton as “warmly sensuous but deeply cool”, her work often combines acoustic sounds with electronics, and her musical aesthetic is strongly influenced by a fascination for aleatoric systems. In a rare Seattle appearance, she will be performing her recent works for basset horn, electronics and voice.